We are now taking orders for nucleus colonies that will be available the first week of May 2018. We make our nucs from our over-wintered stock. 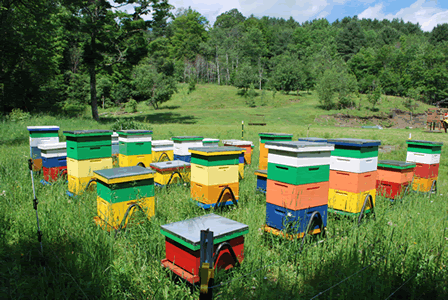 Our bees are mostly carnolian; bred for their quiet disposition and hygienic behavior. They are split, a day later we add a queen cell (grafted from our finest stock) to the nuc. The queen cell will hatch and breed and will be left to grow at least 45 days. We individually check each nuc to make sure that the queen is laying well and has an established brood pattern to ensure that there are bees of all ages. There are usually 3-4 frames of brood and 1-2 frames of food. The nucleus colony will be free of disease and mites, ready to be put into your equipment. There is limited availability, so reserve now. They will be delivered in a wooden nuc box. $175.00. We require a $75.00 deposit per nuc. Checks and credit cards accepted. Please provide us with contact info at time of ordering.